When a person has metastatic cancer, the brain is one of the organs that cancer cells can migrate to. If this happens, the condition is called brain metastases. 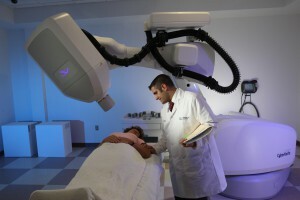 The leading radiosurgery technology CyberKnife is available at most of the cancer centers. 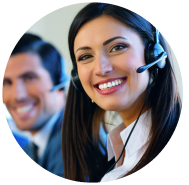 Based on each patient’s unique situation, the doctors determine which radiosurgery technique is optimal for his or her condition and treatment is completed in an outpatient setting in a single session or over the course of several days. If this occurs, radiation treatment is often used to control these areas of disease. Research is finding that utilizing CyberKnife radiosurgery as the initial treatment for people with four or less brain metastases is associated with improved survival and reduced risk of memory loss compared to whole brain radiation. CyberKnife radiosurgery is a very precise image guided treatment that uses multiple beams of radiation from a variety of directions to destroy the diseased area while avoiding the surrounding healthy tissue. The CyberKnife instrument aims many beams of radiation at the same target from multiple directions and angles according to a treatment plan that is designed just for you. CyberKnife moves around you and delivers the beams one at a time. Alone, each beam of radiation is not strong enough to damage the part of the brain it travels through on the way to the target. Where they meet, however, the combined strength is able to destroy the cells. That is very important – especially when treating very sensitive areas in your brain. The combined total amount of radiation from all of those individual beams is much higher than the amount of radiation that could be delivered by conventional radiation, which often leads to better, and safer tumor control and cure. Your doctor may recommend CyberKnife radiosurgery if you have had multiple surgeries already and would like to avoid additional surgeries, or you are too sick to have surgery. If you have more than one serious medical condition, your doctor may determine CyberKnife radiosurgery is a safer option for you. Radiosurgery may, in fact, be your best option regardless of your situation. Although CyberKnife is used to treat conditions of the brain, your doctor may recommend one or the other based on your particular situation.